Dropped for me the other night in Old Sebilis off the Froglok Chef. I recorded the location of -1121, 771, -86. This was on the top floor, the very souther dead-end of the western wing. Chef's PH was the front left froglok in the room. This item is seldom seen in my server's bazaar nowadays, though other pieces of Mrylokar's often are. It becomes slightly more useful again at level 60... Rogues can do assasinations (instant death) with throwing weapons. Can't do that with bow. Having a haste item on your person (such as your epic Ragebringer) makes the delay less irritating. There is a trick that works to increase the pathetic range on the knives as well, at least it does on Tholux Paell where I play my rogue. I'll get to that in a bit. With the tiny damage on the knives, but the improved range using the little trick I will reveal here, you can also do the sneak & hide scouting and pull the mob without nessesarily rushing out in the corridor agroing everything around you or waiting for that ranger and chanter to come pacify and pull when you're already there and can snag the mob. Throwing a knive breaks your hide but NOT your sneak, so you still stand a good chance to remain non-agro to other things around you. Take a single arrow (or a full stack if you prefer, makes no difference, hehe) with as high a range as possible. 150 is what I'm using... Put that arrow in AMMO slot. Now grab a stack of the summoned knives and put them in RANGE slot. This way, when you have thrown all 20 knives, you will manually have to put another stack in RANGE since there is an arrow in AMMO and that screws up the auto-reload from inventory when empty BUT - Your range on the knives will become the range of the item in AMMO instead of the puny 50 that the knives have on them. This still works as I am writing this (March 18 in 2005). Today you do not break hide/ sneak while throwing. Your attacks come out of no where, and you can stop throwing, sneak / hide up to the mob, and open with a sneak attack disc line as if you never attacked. Figure this as a bug but no where near in need of being fixed as throwing DPS is so small. torv these are going for 8k. I picked one up on Brell for 350pp. 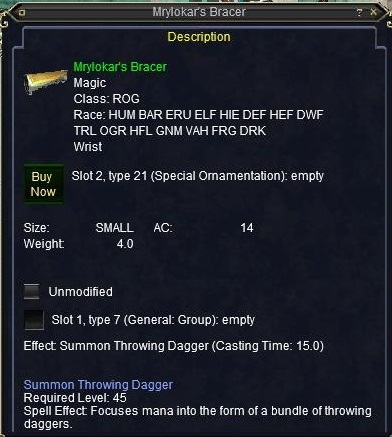 I wanted to know the dmg/dly on the daggers also what is the range on them. #DaRangers, Posted: Mar 11 2002 at 4:41 PM, Rating: Sub-Default, (Expand Post) Have one for sale on the rathe if anyone is intersed. Well cant wait to get me one of these. Never going to have to buy daggers again. What lvl do you have to be to summon the daggers? #DarkdirkDevertibrator, Posted: Sep 25 2001 at 8:33 AM, Rating: Sub-Default, (Expand Post) Ahem please step aside sir you are no gnome rogue. Tis I who am, not you. By the time the reach 45 you shold be grouping with tanks at least 47-48 to have solid aggro off you, in such a group there is no reason for a rogue to be pulling. In fact at level 55 I have not thrown a dagger or shot an arrow in battle for near 10 levels or more since early 40s when LoY came out where I could duo with a healer on weak mobs at dulak zone in. By now I have an idol with nice stats and resists in my range slot, and have my stat bow in storage. This item is almost useless to rogues 45 and up, would have been more useful at lower levels but not against the mobs fought at the higher levels. While I don't play a rouge.... and Item like this would always have it's uses. Imagine being deep inside some far off zone... far from any vendor. Suddenly you run out of throwing daggers.... Well, guess your in for a 10-15 minute run back to some vendor for more daggers.